Turn seat bottom upholstery inside out and place on front of seat. 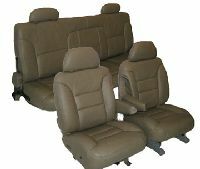 Make sure the center of the upholstery is aligned with the center of the seat back upholstery. Pull the upholstery over each front corner working each side toward the back until they are even; then install hog rings one at a time where required working from the center to each side. Note: If your upholstery set has a plastic “J” channel, there are no hog rings required in that area. Simply snap the plastic channel on to the metal flange on the bottom of the seat frame. Installation is easier if the upholstery is heated. Warm vinyl has more elasticity and is easier to contour. Heating is best accomplished by laying the upholstery in the sun or using a hair dryer but, please be careful not to melt the vinyl. If the upholstery is in a bind, Not Pull. Work each side evenly until you can continue with the installation.